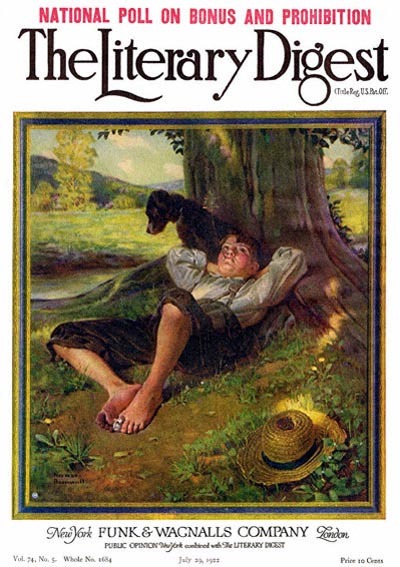 Barefoot Boy Daydreaming, this Norman Rockwell painting, appeared on the cover of The Literary Digest published July 29, 1922. The alternate title for this painting is Lazy Summer Afternoon. This illustration was Rockwell's thirty-ninth picture featured on the cover of The Literary Digest. Rockwell artwork was featured on the cover of The Digest nine times just in 1922 alone. This illustration was also republished on the cover of the June 1946 issue of The Grade Teacher and reproduced on page 60 of Norman Rockwell, A Definitive Catalogue by Laurie Norton Moffatt. With this painting, Norman Rockwell evokes memories of a lazy summer afternoon spent in the company of our own thoughts. Barefoot Boy Daydreaming was only one of 47 Norman Rockwell Literary Digest covers; here is the list of more Norman Rockwell Literary Digest scans. Rockwell's mastery of light in painting is also showcased in this illustration. The dappled light under the tree is one of the effects that allows the viewer to feel a part of the picture. Most of us long for a day we can "waste" daydreaming under an old tree. This boy is enjoying such a luxury. Accompanied by his dog, he is alone with his thoughts. His solitude is interrupted only by the sound of moving water and occaisonally the wind blowing through leaves or grass. He is enjoying chewing on a grass stem. He has even forgotton the bandage on his big toe, another Rockwell trademark. His dog is keeping watch for any sign of trouble or anything of concern. This boy hasn't a care in the world. Ah, if only we could join him.